I put a lot of stress on my bags, like many mobile musicians, and most cheap bags simply fall apart. My airbag shows virtually no signs of wear after months of hard use. As a Manhattanite, I subscribe to the “one bag is never enough” philosophy, so I still have other bags for carrying additional gear. The Airbag itself is best for fitting just a laptop plus an accessory or two, like the power adapter, headphones, a paper notebook, and a Dell Axim PDA, in my case. I have other bags that work better for heavier loads. As a light bag you won’t be embarrassed to wear out, though, the airbag is perfect. The bags are available for EUR 129 / US$149 (slightly more for 16″ / 17″); that may sound pricey, but in four years this bag will still be going while a lesser bag has fallen apart. It’s a great buy for a beautifully-crafted piece of luggage. The airbag craftworks folks themselves are fascinating people and electronic music lovers,and they have an extensive line beyond the Ableton bag. I’ll be talking to them about their products in a coming story. 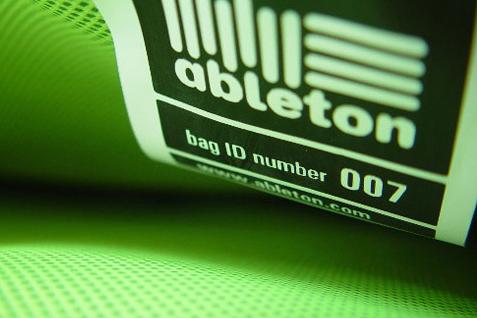 In the meantime, snag those Ableton bags while you can — or check out the other airbag offerings.